In Jewellery QUALITY is very IMPORTANT, always compare. 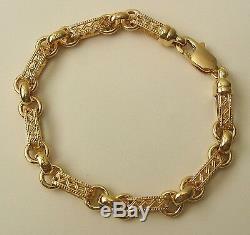 BRAND NEW GENUINE HIGH QUALITY SOLID 9ct YELLOW GOLD. 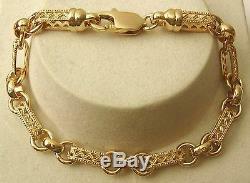 BELCHER FILIGREE Bracelet SECURED with PARROT clasp. One of our latest addition. Each shiny oval belcher link is stamped 9ct, attached. To a beautifully crafted rectangle filigree pieces. GENUINE SOLID GOLD NOT HOLLOW NOT FILLED NOT PLATED. 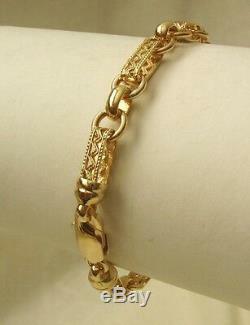 Bracelet Length : 20 cm 7.9 inch approx. 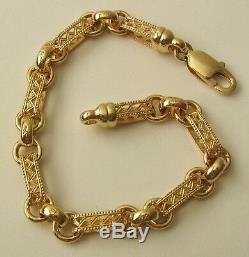 Bracelet Weight : 13.85 grams. Parrot Clasp Size : 16 mm x 7 mm. Our Jewellery is Proudly MADE in AUSTRALIA , with Precision Workmanship. We have LAY - BY. Lay-by payments are to be made into bank account. Please quote your User ID or item number when making lay-by payments into account. Please quote your item number or User id when paying into bank to avoid delays. We are not responsible for duty charges or any other charges. The item "GENUINE 9ct 9K SOLID Yellow Gold OVAL BELCHER FILIGREE BRACELET" is in sale since Monday, September 17, 2018.